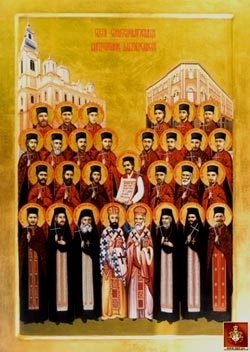 The Orthodox Church in Bosnia-Herzegovina was called on to suffer trial and tribulation on more than one occasion during the twentieth century. First of all, there was World War One and the terror campaign of Austro-Hungarian troops and police, then the genocide during the years of the Ustashi (Croat Nazi) puppet regime in Independent Croatia between 1941 and 1945, then the terror of Tito's partisans and the Communist repression of the post-war years, and finally the bloody trials of the Civil War of 1992-1995. Priest Momchilo Grguchevich was born in 1906 in Foche (Srbinie). He finished seminary in Sarajevo in 1928 and was ordained deacon and then priest in 1929. He served as parish priest in Chelebichi until his martyr's death on 29 November 1945. During the Second World War he had been sentenced to death several times, but remained alive by the mercy of God. In November 1945 he was captured by Communists and executed. According to one account, he was beheaded and his head was sent as a trophy to the Communist headquarters in Chelebichi. Forty-five years later his son, Vasily, was given his father's remains and had them buried by the church in Chelebichi. Priest Dobroslav Blazhevich was born in Visoko in 1916. He finished seminary in Sarajevo and was ordained deacon and priest in 1939. He was captured by the Ustashi in June 1941 and brutally murdered on the road to Bugojno. His body was not found. Archpriest Milan Bozhich was born in Glamoch in 1885 and finished seminary in Relievo. He was ordained deacon and then priest in 1909. During the First World War he was arrested by the Austrian forces of occupation and imprisoned in Travnik, Zenica and Arad. In May 1941 he was arrested by the Ustashi in Sarajevo and then sent to Zagreb, where he was held together with the holy Hieromartyr Peter (Zimonich), Metropolitan of Dabro-Bosnia. From there he was sent to the concentration camp in Danic, then to Gospich, where on the night of 1/2 July 1941 he was martyred. Hieromonk Michael Dzhusich was born in Gledich in 1911. He finished the Theological Faculty and took his monastic vows on 6 January 1934 In the same year he was ordained hierodeacon and hieromonk. His professor was Fr Justin (Popovich). During the War he helped his people. In May 1945 he was captured by partisans together with Protosingel John (Rapaich) and shot in Blazhuje near Sarajevo. Singel John Rapaich was born in 1910. He finished seminary in 1931 and then taught at the Theological Faculty in Belgrade. He was active in helping St Nicolas (Velimirovich). In May 1945 he was captured by partisans together with Hieromonk Michael (Dzhusich). Both were imprisoned, starved and beaten. They were released for a few days, but then on 28 May 1945 they were sent to Sarajevo. They were shot in the village of Blazhuje. According to eyewitnesses they had both been forced to dig their own graves. Priest Jovan Zechevich was born in 1895 in Bosnisky Novy. He finished seminary in Sarajevo and was ordained deacon and priest in 1922. In June 1941 he was abducted by the Ustashi with a group of Serbs, taken to Koprovinc, tortured and then murdered. Priest Bozhidar Iovich was born in Busovach in 1912. He finished seminary in Sarajevo and was ordained deacon and then priest in 1937. After the Second World War he was sentenced to prison for eight years. He died on 9 May 1951 in a penal institution in Zenica. Archpriest Bogdan Lalich was born in Sarajevo in 1889. He finished seminary in Prizren in 1912 and was ordained deacon and priest in 1914. In July 1941 he was captured by the Ustashi and imprisoned in the seminary building in Sarajevo. He was then sent to the concentration camp in Gospich, where he died. Priest Tifun Maximovich was born in Zenika near Sarajevo in 1873. He finished seminary in Relievo and was ordained deacon and priest in 1899. He was persecuted by the Austrian authorities for his missionary activities among Serbs. They arrested him at the outbreak of the First World War and he was shot in Semizovec in September 1914 and buried there. Priest Velimir Miyatovich was born in Sokoc in 1901 and finished seminary in Sarajevo. He was ordained priest in 1923. When the Second World War broke out, he was expelled to Serbia by the Ustashi. He was shot by partisans in March 1945. Priest Bozhidar (Bozhina) Minich was born in Kolashino in 1901. He finished seminary in Sarajevo and was ordained deacon in 1926 and priest in 1927. He was shot by partisans in 1945. Priest Miladin Minich was born in Plevlia in 1913. He finished seminary in Sarajevo and was ordained priest in 1937. Immediately after the proclamation of an independent Croatian State in 1941, he was murdered by the Ustashi in the parish house in Bileshevo. Bishop Barnabas (Nastich) was born in Gary near Chicago on 31 December 1914. He lived in the USA with his parents until the age of eight, when his family returned to their native land and lived in Sarajevo. After high school he entered the Theological Faculty in Belgrade with the blessing of St Nicholas (Velimirovich). He graduated in 1937 and was appointed catechist at the National Teachers’ College and High School in Sarajevo. He took his monastic vows in the Monastery of Mileshevo in 1940, taking the name Barnabas. He was ordained hierodeacon by Hieromartyr Peter (Zimonich), Metropolitan of Dabro-Bosnia. The Second World War found Fr Barnabas in Sarajevo, where he remained during the whole sorry period of the independent Croatian State, sharing the fate of his people. The leader of the Croat Ustashi, Ante Pavelich, invited him to Zagreb and offered him the position of Bishop in the Croatian Orthodox Church, which had been set up at that time. Fr Barnabas categorically refused. In 1947 he was chosen Vicar-Bishop of Khvostan. In 1948 he was sentenced by a Communist tribunal in Sarajevo to ten years of strict incarceration for ‘treachery, weakening the economic and military power of the nation, aiding terrorist groups, making enemy propaganda and spying for the Anglo-Americans’, as is noted in the records of the Sarajevo District Tribunal on 1 March 1948. He began his sentence in Zenica in solitary confinement and was subject to humiliations and mockings. In 1949 he was transferred to prison in Sremska Mitrovica. During his transfer, Bishop Barnabas and other prisoners were involved in a railway accident, as a result of which both his legs and one arm were broken. The police stopped any witnesses from giving the injured first aid. Moreover, in the operation theatre at hospital, secret police officers prevented the doctors from giving medical assistance. After several months in hospital, Bishop Barnabas was sent to Belgrade. Here he was confined in the Monastery of the Presentation, where he spent about a year, lying down. In view of the fact that Orthodox faithful began to make frequent visits to the Bishop, the secret police transferred him to the Monastery of Gomionica near Sarajevo, where he remained under house arrest until 1960. After serving his term, the Bishop was forbidden to return to his Diocese and he moved to the Monastery of Krushedol on Mt Frushka and then to the Monastery of Beochin, where he passed away on 12 November 1964 in unexplained circumstances. According to one account he was poisoned. Archpriest Marko Popovich was born in Kupres in 1876. He finished seminary in Relievo and was ordained deacon and then priest in 1901. During the First World War he was arrested by the Austrian authorities. On 6 June 1941 he was arrested by the Ustashi and on the night of 23/24 June he was brutally murdered. In 1952 his remains were exhumed and reburied in the cemetery in Bugojno. Archpriest Dimitri Rayanovich was born in Novy Varosh in 1909. In 1931 he finished seminary in Prizren and was ordained deacon and priest in 1932. He was captured by the Ustashi in 1941 and murdered near Iliyasha. Priest Budimir Sokolovich was born in Tegara in 1910. He finished seminary in Cetinje in 1931 and was ordained deacon and priest in the following year. In 1942 he served in Zlatibor. In 1945 he was shot by partisans in Milyevin. Priest Relia Spakhich was born in Rogatica in 1906. He finished seminary in Sarajevo and was ordained deacon and priest in 1927. On 10 August 1941 he was shot by the Ustashi together with 27 parishioners in woods near Butmir. Priest Laza Chulibrk was born in Voyevc in 1847. Later he became a deacon and priest. During the First World War he was interned in Arad, where he passed away on 12 March 1915. Priest Savo Shkaliak was born in Lachani near Pleval in 1909. He finished seminary in Prizren in 1931 and was ordained deacon and priest in 1932. During the Second World War he served in the Diocese of Zhicha. He was murdered in Slovenia in 1945. Priest Savo Shkaliak was born in Stupen. After finishing seminary in Relievo he was ordained deacon and then in 1907 priest. At the outbreak of the First World War he was held hostage by occupying forces. Fr Savo was tortured and taken out to be shot on several occasions. He passed away in hospital in Sarajevo on 9 April 1918. Priest Milorad Vukoiichich was born in Pleval in 1917. He finished seminary in Sarajevo and was ordained deacon and priest in 1940. He was sentenced to death by a partisan military tribunal as a ‘chetnik’. The sentence was carried out in 1945. Priest Ratomir Yankovich was born in Pleval in 1915. He finished seminary in Sarajevo in 1937 and was ordained deacon and priest in 1938. He was shot by Italian occupying forces on 4 December 1941. Archpriest Mikhailo Yevchevich was born in the village of Zhirch in 1891 and was ordained priest in 1913. He was shot by partisans in Novy Pazar in 1945. Priest Dushan Priovich was born in Pleval in 1906. He finished seminary in Prizren in 1928 and was ordained priest in 1929. He was shot by partisans in Pleval in spring 1946. Priest Dobrosav Sokovich was born in Mokroni near Vishegrad in 1915. After finishing seminary in Sarajevo he was ordained priest in 1939. He was arrested by the Ustashi on 25 July 1941 and later sent to Sarajevo, where he was murdered. Abbot Nestor (Trkulia) was born in Tsrny Lug in 1899. He finished the school in the Monastery of Rakovica and took his vows in the same Monastery in 1924. He was ordained hieromonk in the same year. He became Abbot of the Monastery of Mileshevo before the outbreak of the War. He was shot by partisans in 1941 and buried in his Monastery. Archimandrite Seraphim (Dzarich) was born in Ochevino near Pleval in 1875. He finished the two-year priests’ courses in the seminary in Prizren. He took his monastic vows in Holy Trinity Monastery near Pleval in 1897. He was ordained hierodeacon in 1898 and hieromonk in 1900. He was a brother and then main priest of Holy Trinity Monastery. He was awarded the order of St Savva (4th and 5th degrees) in 1924 and 1925. He was shot by partisans in Pleval on 1 December 1941. Priest Andriya (Shilyak) was born in Pleval in 1898. He finished the theological school in Prizren in 1921 and was ordained deacon and then priest in 1922. He particularly proved his missionary abilities in his work with the Red Cross, for which he was awarded silver and gold medals. He was shot by Italian occupying forces in 1941. Archpriest Slobodan (Shilyak) was born in 1881 at Ilina Gora near Pleval. He finished seminary in Prizren and was ordained deacon and priest in 1903. During the Balkan Wars he served as a military chaplain. During the First World War he was arrested and sent together with a group of well-known Serbs from Pleval to a camp in Boldogason in Hungary. He was shot by partisans in Kosanice on 5 December 1943. Protopresbyter Simo Baniac was born in 1871 in Gorny Rybnik. He finished seminary in Relievo in 1893 and was ordained priest in 1897. He was butchered by the Ustashi in 1941. Protopresbyter Mirko Stoisavlevich was born in Otishiche in 1885. He finished seminary in Zadar in 1908 and was ordained deacon and priest in 1909. He was captured by the Ustashi on 30 June 1941, tortured and murdered. Protopresbyter Milan Baniac was born in Drvar in 1886. After finishing seminary in Prizren in 1910 he was ordained deacon and priest. He served in Banja Luka. He was captured by the Ustashi on 14 June 1941 and murdered after being brutally tortured. Priest Milan Golubovich suffered with him. Protopresbyter Vukosav Milanovich was born in the village of Savai near Bosnisky Petrovec. He finished seminary in Relievo and was ordained priest in 1892. Fr Vukosav was captured by the Ustashi, who murdered his children and savagely tortured him. He died from his injuries after torture in Lica. Protopresbyter Milan Popovich was born in Bosniska Gradishka in 1874. He finished seminary in Relievo in 1899 and was ordained deacon and priest in the same year. He was captured by the Ustashi in July 1941 and imprisoned in Kulen Vakuf. He was brutally tortured, then had his throat was slit and his body was thrown into a pit. Priest Rodoliub Samardzhich was born in Rogatice in 1907. He finished seminary in Sarajevo and was ordained deacon and then priest in 1931. He was murdered by the Ustashi in June 1941. Priest Damian Shtrbac was born in Plaven near Knin in 1912. He finished seminary in Cetinje in 1932. Two years later he was ordained deacon and then priest. At the outbreak of the First World War he was in Bosanky Grakhov. He was captured by the Ustashi in June 1941 and tortured. He was sent to Klin and then to the camp in Gospich. Before his murder his skin was flayed from his body. His body was thrown into a chasm at Yadovna. Αναρτήθηκε από ΝΕΚΡΟΣ ΓΙΑ ΤΟΝ ΚΟΣΜΟ στις 12:38 π.μ. 15 Νοεμβρίου: καλή Σαρακοστή - καλά Χριστούγεννα!